This one is for when SIZE matters! 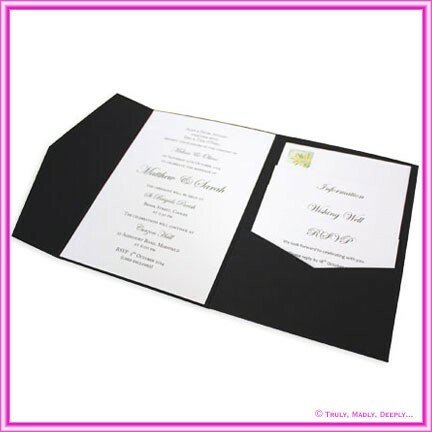 When opened it measures 380x210mm and is the largest invitation card in the range! This beautiful cream card stock has a subtle and almost smooth natural textured finish and is one of the easiest card stocks to print. Our A5 Pocket Fold Cards arrive flat packed for self assembly and measure 21cm x 15.25cm (or 6x8.25 inches) when folded & glued. 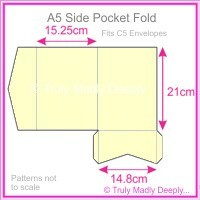 All of our A5 Pocket Folds fit into our standard C5 Envelopes, unless bulky decorations are used. Be careful if considering similar product from overseas as they are often a different size and obtaining envelopes to fit is difficult and relatively expensive in Australia. Ours are specifically designed to fit our standard envelopes & box sizes. Hi Ben, Thank you for sending the order so quickly! I received the box yesterday and the paper looks great. Thanks.